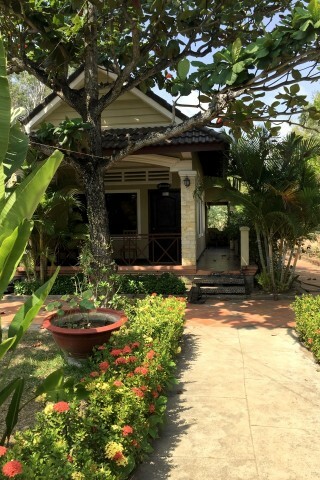 A small boutique with a great location right on the sea, Brise de Kep Boutique is not to be confused with its more centrally located sister property by the bus station. The boutique is at the quieter Koh Tonsay pier end of the seafront. Most of the eight ground floor rooms face the sea and are accessed via a shaded terrace that gives out on to a pretty garden. The rooms are large, airy and clean, and each has a good mattress, hot water bathroom, air-con, fridge, TV and kettle, plus inclusive breakfast. Boutique refers more to the size than the ambience, and the staff came across as slightly befuddled, but this is a pleasant spot from which to explore Kep. It’s one of the only ones with a seafront restaurant, which is a beautiful spot to start the day. The restaurant/bar serves up Khmer and French food, with an emphasis on seafood -- main dishes are from $4 upwards. They offer brunches on Saturdays for just $5. A mini-beach with loungers and a cabanas is a breezy spot to enjoy the views of Rabbit Island. Check rates at Brise de Kep Boutique on Booking.com.